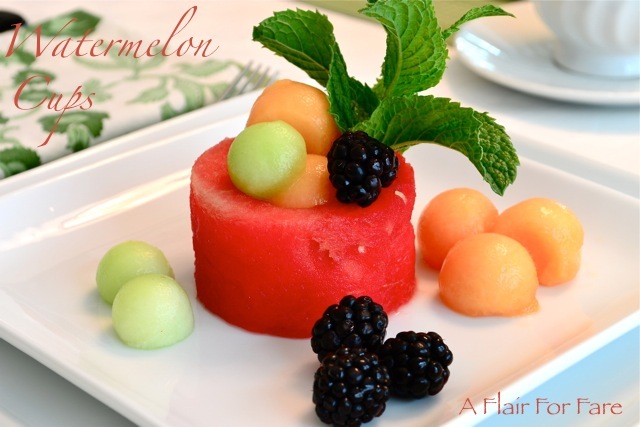 We’re in the middle of one of my favorite seasons – watermelon season! In the 60’s and 70’s, my dad grew truckloads of this delectable, juicy, red fruit and sold them at the Farmer’s market for 50 cents each. Melons were plentiful growing up on the farm and we looked forward to ending a hot Alabama summer day with a big, dripping 4 inch slice. No forks please! Just hold a piece up to your face, take a big bite and let that sweet, sticky nectar run down your chin and neck. That’s the way it was done. Today, I’m a bit more particular when it comes to serving my guests; forks are definitely required- at least at the dinner table. I came across this idea years ago in a Southern Living magazine and finally just recently tried it out for a special brunch. It’s easy to do and you will really wow your guests with this beautiful presentation. I’ve included the link which includes step by step instructions on how to make the cups plus other ideas and recipes for watermelon. Give it a try!